Why aren’t ants and roaches trapped in the bait stations? Roaches and ants aren't trapped in the bait stations because these insects take the bat from the stations back to their respective nests. Combat bait stations are not traps or motels, and bugs will not stay in the bait stations. Roach bait and ant bait work to kill the nest, the source of the infestation. "Source kill" happens when ants and roaches eat the bait in the bait station and then carry it back to the nest. Because the bait is transferred back to the nest, baits are more effective than traps, which only kill the insects that come to the traps. 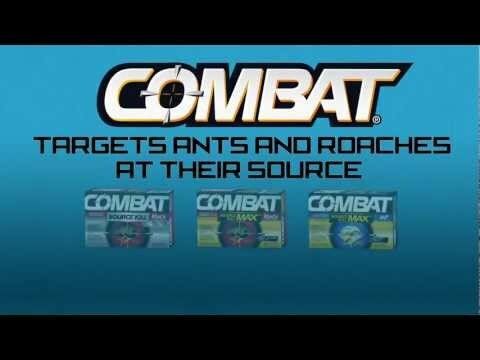 The only sure way to eliminate ants and roaches is to target them at their source – with Combat® baits and gels. Once ingested, ants and roaches infect the rest of the colony and nest. Roaches spread the bait to the nest by returning to the nest with the bait, dying, and are then eaten by other roaches - further spreading the insecticide. Ants spread the bait back to the colony by taking it back as food to share. The result of Combat baits is a domino like effect that kills ants and roaches at their source. Unlike aerosol sprays that are contact killers, Combat baits and gels target the source of the problem and get rid of your ant and roach infestations.